A problem of interest for ecology and conservation is that of determining the best allocation of survey effort in studies aimed at estimating the proportion of sites occupied by a species. Many species are difficult to detect and often remain undetected during surveys at sites where they are present. Hence, for the estimator of species occupancy to be unbiased, detectability needs to be taken into account. In such studies there is a trade-off between sampling more sites and expending more survey effort within each site. This design problem has not been addressed to date with an explicit consideration of the uncertainty in assumed parameter values. 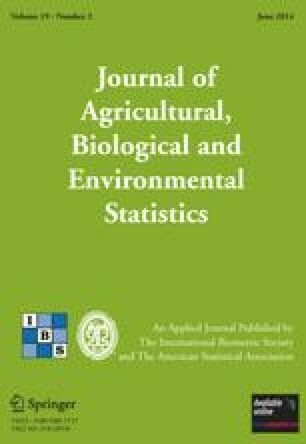 In this article we apply sequential and Bayesian design techniques and show how a simple two-stage design can significantly improve the efficiency of the study. We further investigate the optimal allocation of survey effort between the two study stages, given a prior distribution for the parameter values. We address this problem using asymptotic approximations and then explore how the results change when the sample size is small, considering second-order approximations and highlighting the value of simulations as a tool for study design. Given the efficiency gain, we recommend following the sequential design approach for species occupancy estimation. This article has supplementary material online. Supplementary materials for this article are available at 10.1007/s13253-014-0171-4.